Please use the following shape for the question. From this shape we are able to see that we have a square and a triangle, so lets split it into the two shapes to solve the problem. We know we have a square based on the 90 degree angles placed in the four corners of our quadrilateral. Since we know the first part of our shape is a square, to find the area of the square we just need to take the length and multiply it by the width. Squares have equilateral sides so we just take 5 times 5, which gives us 25 inches squared. We now know the area of the square portion of our shape. Next we need to find the area of our right triangle. Since we know that the shape below the triangle is square, we are able to know the base of the triangle as being 5 inches, because that base is a part of the square's side. To find the area of the triangle we must take the base, which in this case is 5 inches, and multipy it by the height, then divide by 2. The height is 3 inches, so 5 times 3 is 15. Then, 15 divided by 2 is 7.5. We now know both the area of the square and the triangle portions of our shape. The square is 25 inches squared and the triangle is 7.5 inches squared. All that is remaining is to added the areas to find the total area. Doing this gives us 32.5 inches squared. 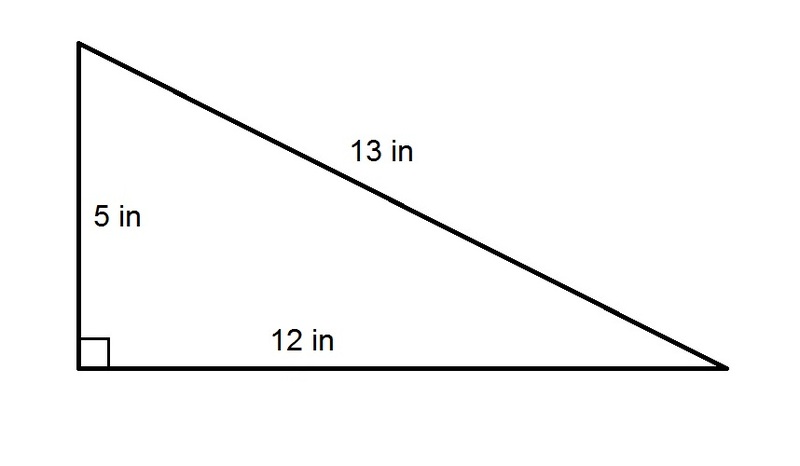 The hypotenuse of a right triangle is 25 inches; it has one leg 15 inches long. Give its area in square feet. What percent of the above figure is green? The correct answer is not given among the other choices. Refer to the above diagram. 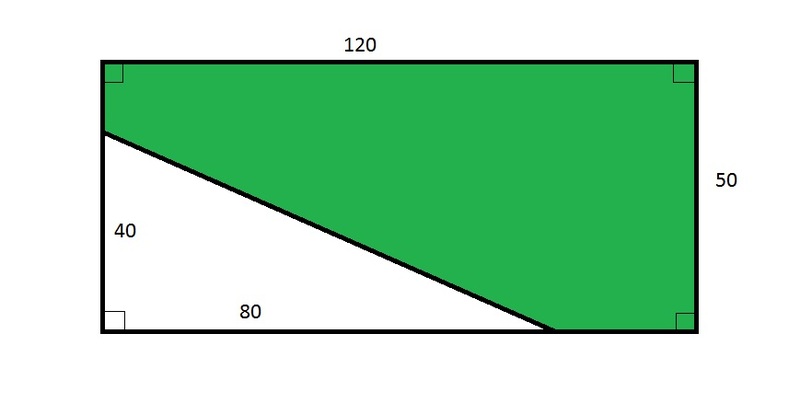 Give the ratio of the area of the green region to that of the white region. That is, 11 to 4. A triangle has a height of 9 inches and a base that is one third as long as the height. What is the area of the triangle, in square inches? The area of a triangle is found by multiplying the base times the height, divided by 2. Given that the height is 9 inches, and the base is one third of the height, the base will be 3 inches. We now have both the base (3) and height (9) of the triangle. We can use the equation to solve for the area. The fraction cannot be simplified. The hypotenuse of a right triangle is feet; it has one leg feet long. Give its area in square inches. Give the perimeter of the above triangle in feet.